Nothing is better than retaining the natural tooth as long as possible. State-of-the-art dentistry has many different technologies at its disposal to preserve a tooth, even if the canal system is very delicate and has lots of curves. Our products will cover your entire treatment sequence – from diagnosis to trepanantion to measurement, preparation and follow-up. In endodontics, you have to be able to see the smallest structures so as to determine the constitution and curves of a root. Having the right X-ray system is indispensable for planning and predicting the success of the treatment. The small instrument heads of our turbines, handpieces and contra angles not only allow a clear and direct view of the area to be treated, but also sufficient room for movement when treating molars. Knowing every micrometer in the root canal ensures safe orientation in the root canal and allows you to definitely reach every micrometer of the canal. At the same time, the tooth is treated gently. With the automatic Start/Stop function of DentaPort ZX OTR, the file cuts at the right moment and stops as soon as a specified torque limit is reached. The intelligent instrumentation control reduces the speed or stops the file when a specified point is reached. Fluids do not affect the precision of the measurement. The device is calibrated automatically, a function that simplifies the dentist’s work. High-performance light polymerization is the last step in completing a bacteria-proof root filling. We have an LED curing light for this purpose, which guarantees constantly high light intensity without scattering and, at the same time, is pleasant for the patient. The quick curing times shorten the treatment time. Free positioning of small imaging volumes ensures that you obtain extensive information. You benefit from low doses, highly detailed images and minimal artifacts and can formulate a precise diagnosis. 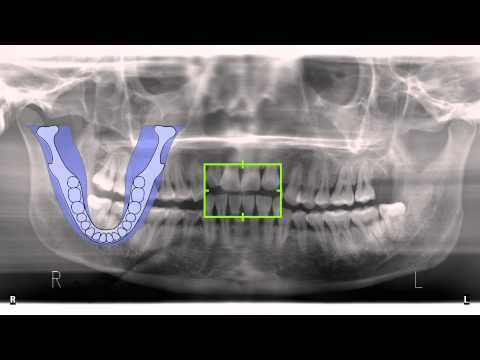 Alternatively, an intraoral X-ray will clarify the situation.